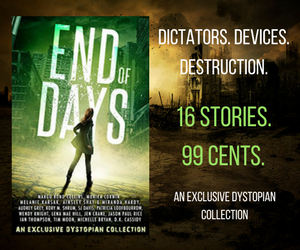 New Release: End of Days Dystopian Collection & New Series Prequel! I'm super excited to share that I have a new novella available in the End of Days box set! My novella, Scorched: Sun Extinction is the prequel of a new series that will release this fall, The Burnt Earth Series. 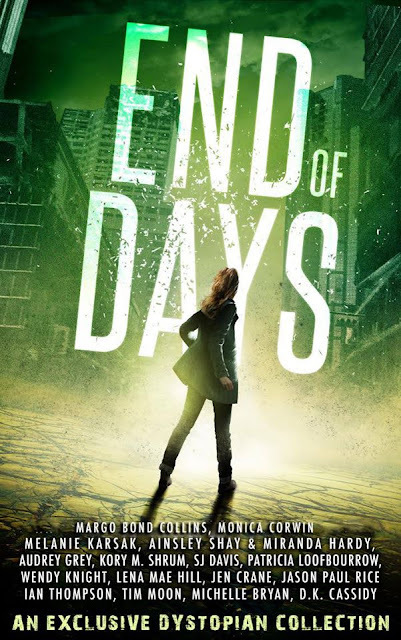 Take a look at the awesome cover for End of Days. Readers who love everything from The Maze Runner to The Handmaid's Tale will revel in the tension of sixteen underdogs fighting to beat the odds in their own gritty worlds. My contribution to the collection is a prequel to my upcoming novel Scorched: The Last Nomads. This series is set in a future where civilization is devastated in the wake of a massive solar storm. Here is the cover for my novella included exclusively in End of Days. To save her sister, Ash must travel across the sunburnt earth through Hell’s Passage to learn the fate of the Low Tide outpost. One hundred and sixty-seven years ago, a solar coronal mass ejection devastated civilization. In the blink of an eye, technology died. Destroying the grid might not have brought about our end, but the solar superstorm blighted the land and sickened mankind. In the wake of the crisis, lawlessness ruled, and societies fell. Now, The Park, one of the last communities, teeters on the brink of extinction. When the annual shipment of supplies from Low Tide outpost fails to arrive, The Park’s survival is threatened. Ash and her friends must trek across the sunburnt earth through Hell’s Passage, the ruins of an abandoned city, to find out what went wrong. But the wasteland itself isn’t their biggest problem. Her group must survive the night when the wailers, creatures born in the CME’s wake, stalk their prey. But it’s worth the risk. Ash would do anything in order to ensure her sister, Keyes, stays alive, even if it costs Ash her life. 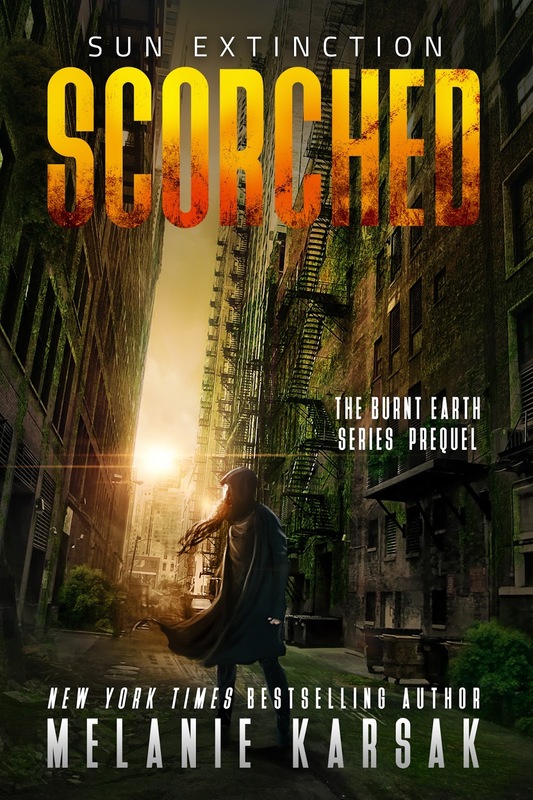 Scorched: Sun Extinction is a prequel to The Burnt Earth Series. Leaning against the doorframe, I stared out at the yard. A stiff breeze blew, carrying the dust with it. I winced when the grime gusted into my eyes. Even though the sun had just come up, it was already burning hot. 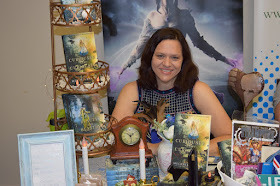 I swallowed hard, my mouth dry, and looked back at my sister, who lay sleeping on her cot. She slept with both arms above her head. “Dancing with angels,” my mother used to say when she saw her sleeping like that. I remembered the line well because the last time she’d said it, my sister was only two, and our father had just died of solar sickness. “There are no angels left,” I’d said. “The sun scorched their wings off.” I was angry, and I thought I had a right to be. But I didn’t have the right to hurt her. My mother didn’t reply, merely gazed down at my little sister, but I’d seen her dash the tears off her cheeks. What a horrible thing for a daughter to say to her mother. I sighed and looked back out across the compound. Somewhere in the distance, a piece of metal slapped against a pole. Its banging kept time with my thoughts. One: The number of times the delivery from Low Tide had ever been late. Ever. And even that time, they’d arrived the next day. Two: The number of public conversations the elders had held about what to do about the late delivery. The decision? Wait. Do nothing. Just wait. Two was also the number of weeks the current delivery was late. Three: The number of days since the elders had last addressed the community. Four: The number of times Faraday, Lordes, Nasir, and I had talked about what we thought should be done. Five: The number of minutes before we went to speak to the elders. The time for waiting was done. I headed back inside and knelt beside my sister’s bed. She sighed in her sleep, winced, and then relaxed again. I listened to her steady breathing. She looked beautiful when she slept. Her red hair framed her face. Her brow, perpetually scrunched in concentration when she was awake, was relaxed and smooth. While asleep, she looked younger than sixteen. In her teenaged face, I saw the shadow of the little baby she once was. I also saw my family. Her eyebrows arched just like Mom’s used to. She had Dad’s perfectly shaped lips. And her eyes, hidden behind those long lashes, were exactly the same kaleidoscope of colors as mine: a storm of green, brown, gray, and gold. We were more alike than either of us cared to admit. And right now, we were all each other had. And if the supplies from Low Tide never arrived, we’d both be dead within the year. Nasir’s silhouette reflected against the door. I rose and set my sister’s canteen on top of the table beside her bed. Leaning over, I kissed her lightly on the forehead. She stirred but didn’t wake. She’d probably be mad if she knew I’d done that. At sixteen, my sister was young enough to be willfully independent and not yet old enough to be sentimental. At twenty-five, having seen a quarter of the people in our community die, I knew the value of sentiment. I grabbed my bag and headed outside, closing the door behind me. Nasir, Lordes, and Faraday were waiting. Nasir looked over my shoulder. “Where’s Keyes?” he asked. He nodded then motioned to all of us to follow him as we headed toward Park Building. “Think they’ll listen?” Lordes asked as she yanked her long hair into a tight braid. “Then we need to make them agree,” I said. The others nodded but said nothing else. Faraday held the door open as we entered Park Building. The cracked marble floor and old reception area were covered in dust. A faded sigil on the wall, half broken, read National Park Ser—the rest had fractured apart long ago. The little image at the center depicted a lush green tree and a river. Like always, I paused to study the image carefully. He and the others waited at the door to the stairs. I turned and joined them. Faraday and Lordes went ahead. I shook my head. “No, it’s just…the tree,” I said, looking back over my shoulder. Nasir looked behind me. His eyes got a faraway look, but he didn’t say anything. He didn’t have to. I understood his expression. It was mourning for something we never had, something that felt like one of the old fairy tales Mrs. Lowe used to tell until the solar sickness took her too. “Let’s go,” Nasir said, reaching for my hand. His hand was warm and strong. His calloused fingers, dry and damaged from hard labor, slipped between mine. I gave him a soft smile. We bypassed the second floor where the infirmary and school were housed and made our way to the third-floor landing. Before we reached the others, Nasir kissed my hand quickly then let me go. I tried not to be distracted by the flip my stomach did in response. Faraday and Lordes waited for us. When we arrived, Lordes reached for the door handle, but paused, her hand resting on the lever. “Don’t worry. They’ll agree,” I reassured her and the others. “They have too or else…” Lordes said, trailing off. She didn’t have to finish. We all knew the costs. The supplies from Low Tide were essential to life. Lordes pushed the door open. We walked down the long hallway. Here, on the third floor, we kept the last remnants of civilization safe, sacred. This floor was reserved for the books people had managed to scavenge, stores of medicine and weapons, both of which were kept under lock and key, and other pieces of the lost world. I looked into the library. Behind the door, shelf after shelf was lined with books. The room was empty, and no doubt it would stay like that until Keyes got there. I followed the others as we approached the double wooden doors at the end of the hallway. It had been one hundred and sixty-seven years since the solar superstorm, one hundred and sixty-seven years since a coronal mass ejection—ten times bigger than any in recorded history—had erupted from the sun and forever changed our world. While it had started with the sun, years of decay, disease, and death followed. When I was a kid, I would sit among the books and read all day long about trees, and oceans, and cars, and cities, and movies, and ice cream. The world described in the pages of those books sat in ruins around me. Eventually, I stopped reading. What was the use? Lordes knocked on the door. As I entered the meeting room, I wondered what people had once discussed there. What important issues had they debated? Had they sat there doing nothing as the sun warned them that she was about to undo our world? Had they sat there doing nothing when the riots began? 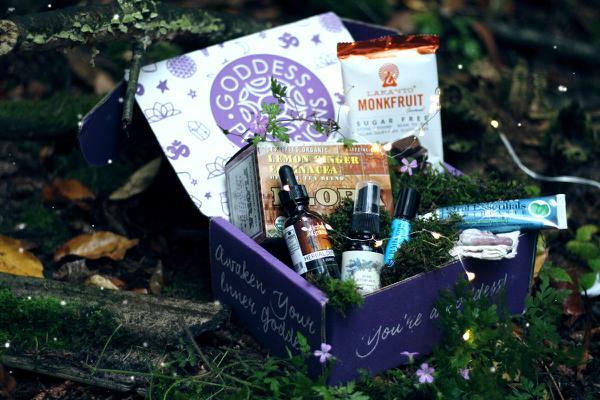 What did they do to stop it when diseases ran rampant, unimpeded by modern medicines? And when it became evident that the solar ejection had done more than knock out our electronics, that it had brought a disease along with it that devoured mankind from the inside, what had they done? What we knew about what had happened came to us through people’s memories. The sun had orbed bright. The sky all around the globe had illuminated in a swirl of colors: green, indigo, violet, and yellow. Then, planes fell out of the sky. Cars crashed. The lights went out. The planet went silent. People’s ears buzzed and rang for weeks. Those who’d been outside at the moment of the solar ejection got sick and died within a matter of days. And then, mankind fell apart. I sighed. The past didn’t matter. What mattered now was the future. And without the supplies from Low Tide, there was no future. Getting my thoughts in check, I followed the others into the room. The elders sat on the old furniture looking out into the distance. Ramsey and Carrington sat on a wooden bench, Gutierrez on an old leather-covered chair, its material cracked and faded. Ramsey looked up at us from under his bushy white eyebrows. His hands folded in his lap, he looked like he was ready to say no. But the dark spots on his cheek looked bigger than they had last time I’d seen him, and he was thinner than I remembered. I realized then that he had not addressed the community in months. Only Carrington and Gutierrez had shared the elders’ decisions. Now I knew why. Ramsey had the solar sickness. Carrington, who’d been close to my mother, lifted her gaze to me and gave me a reassuring smile. Gutierrez motioned to some wooden chairs. “Sit, if you like,” he said. “Out with it then,” Ramsey said in a gruff voice. “Make do?” Nasir asked, his voice thick with frustration. “There is not a single person in this community who doesn’t know what Low Tide’s absence means. We need their supplies. They need ours. If they didn’t make the trip through Hell’s Passage, either something went wrong in their community or—” he said then broke off, unable to speak the unthinkable. “Or the wailers overtook them,” I finished for him. The wailers. No one knew for sure if they were man or animal, but what we did know was that they were monsters. Twisted creatures born of radiation, disease, and starvation, they lived beyond our walls in the wastelands and only came out at night. They had not existed in the world that once was. They’d been born out of its death. “And if they are simply late?” Carrington asked. “Then we’ll know. If there is a problem with the trade, we need to know. If they’re just late, we’ll bring the supplies back with us,” Lordes said. “We depend on them. Maybe they got sick. Maybe someone attacked them. We need to find out,” Faraday added. Gutierrez nodded in agreement then looked at Ramsey. “And what happens if the ships break down? Or you have an accident? Or something goes wrong?” Ramsey asked, frowning. “Then we’ll make the trip by foot. It’s a risk we are all willing to take,” I replied. “The Dead Troupe survives the night,” Lordes said, referring to the last nomads who traveled between the districts. Half warriors, half-entertainers, the Dead Troupe came to our community once a year. They were the only people who knew how to make it in the wasteland after the sun went down. And they were the only ones, besides Low Tide, we ever saw. All the other communities were too far away. “Yes, but if we don’t go, you risk the safety of everyone here,” Nasir said. Ramsey frowned. Without his approval, we’d never be able to go. I watched Ramsey’s expression as I spoke. He went from rage to embarrassment to acceptance. He knew I was right. We had two months’ worth, maybe less, of the supplies Low Tide harvested from the sea floor. We needed them to make medicine. Without them, we were in trouble. Gutierrez and Carrington looked at him. Ramsey stared out the window. I followed his gaze across the yard, beyond the wall, and across the wasteland we called Hell’s Passage. Broken buildings, metal, and glass gleamed in the distance. Beyond that, where the land and sea met, was the community of Low Tide. “When do you want to leave?” Ramsey finally asked. “Tomorrow at dawn,” Lordes answered. “Thank you, sir,” I said to Mister Ramsey who nodded. “Thank you all,” I said, turning to Carrington and Gutierrez. With a nod, Lordes motioned for us to go. Carrington rose and followed us to the door. When the others exited, she took me gently by the arm. “Let the others go,” she said, jerking her chin toward Nasir and the others. Her eyes pleaded with mine. I definitely was not sure about that. And if I knew my sister, more than being mad, she’d want to come, and that couldn’t happen. Carrington nodded. “Just think about it,” she said then let me go. I turned and joined the others. We headed down the hallway. “I’ll go to the well house, see what can be spared,” Lordes said. “Sure you’ll be ready by tomorrow then?” Lordes asked. Despite the tension, we all chuckled. When we reached the lobby, everyone headed back outside. I paused once again as I passed the sigil. “See you later,” I called to the others. I gave him a soft smile which he returned. He nodded then headed outside. 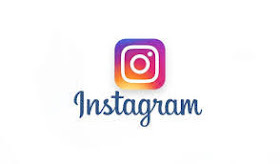 I turned back to the image. How peaceful it looked. The thick green leaves seemed to wave in the breeze, the blue brook tumbling over the rocks. Everything looked so alive. So fresh. I closed my eyes and imagined the place. I could envision the people dancing like angels, their bare toes on the soft green grass, moisture on their lips. I tried to inhale the freshness of the image, but only dust, grime, and dry air filled my nostrils, choking me as I took a breath. The solar storm had forever damaged our planet. Now it was hot, and dry, and barren. The damp green earth was long gone, just like the angels. I turned away from the image and headed back outside. I hope you've enjoyed a look at Scorched: Sun Extinction. I'm really excited to start rolling out this series this fall! Until then, it's the end of the world as we know it--again!